Chemigation is the practice of applying agrichemicals to cropland using an irrigation system to distribute both the water and chemical. The chemigation certification program is responsible for training Nebraska producers about the Nebraska Chemigation Act and the Rules and Regulations as developed by the NDEQ. Certification applicants are required to attend a training program and pass an exam. The Act allowed the NDEQ to contract with the University of Nebraska to deliver the training program. Since 1987 UNL has provided in-person educational programs for approximately 4200 individuals who wished to use chemigation. A chemigation applicator certification card will be issued to successful applicants by the NDEQ. The certification expires on January 1, 4 years after it is issued. For example, certifications issued in 2011 will expire on January 1, 2015. In 2009, The NDEQ entered into a contract with UNL Extension to develop an internet based training program for recertifying chemigators. The online certification is only for recertification, it cannot be taken for initial or first time chemigators. The materials needed to complete the training program online can be accessed from this page or by contacting your local UNL Extension Office for a printed copy of the materials. The UNL Online Chemigation Certification Training program covers all of the information presented at the in-person training events and uses the same test. The training program is designed so that you can complete the training (but not the final test) in a series of online sessions if you wish. It consists of a series of modules which contain text, video clips and calculators to provide chemigators with the necessary information to employ chemigation in an effective, efficient and environmentally safe manner while safeguarding farm workers involved in chemigation. Below are instructions on how to complete each module of the training program. Completing the modules of this online training program and passing the online or written exam at an extension office will allow you to legally apply chemicals using chemigation in Nebraska. Please Note: The on-line Chemigation Test (final) will need to be taken at one of the sixteen on-line testing sites in Nebraska. All course materials can be studied at home but the final test must be taken at an approved extension office. In order to complete your training, you need to study each chapter and complete any activity related to that module. Each module/activity is "locked" meaning you will not be able to proceed until completing the previous section. IMPORTANT: Please print ALL parts off for easy access to online course. Proceed to Nebraska Chemigation Training. On-line Chemigation Testing Sites in Nebraska - This link contains contact information for the sixteen testing sites in the state. Applicants that are recertifying &/or retesting need to call a testing site to schedule a time to test. This link gives address and phone information for each of the sixteen on-line testing sites. A list of Nebraska certified applicators and the year their certifications will expire can be found on the NDEQ website by selecting the 'Focus on Water', then clicking on Chemigation Applicator List. 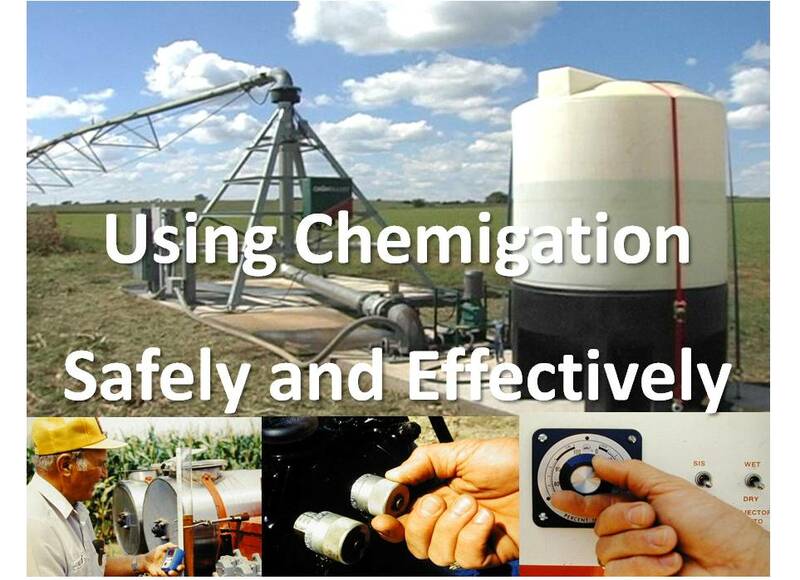 For more information about Chemigation requirements in your area contact your local NRD. If you have questions about the online training program, please contact the Extension Office for your county or contact Pesticide Safety Education Program at (402-472-1632) or by email (pested@unl.edu) .